Dinnerware Bowls from cambro and carlisle are top of the line plastic, paper, and foam bowls for restaurants. We also carry china and glass bowls from anchor hocking, libbey and syracuse china. Wholesale Dinnerware Bowls from the Restaurant Supply superstore make your tabletop settings perfect. 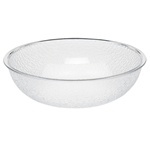 Cambro Swirl Bowl Clear 5 Oz. 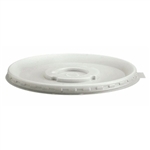 Cambro Cam-Ware Round Pebbled Bowl 10 in. Cambro Pebbled Round Bowl 15 in. Cambro Pebbled Round Bowl 23 in. Cambro Cam-Ware Pebble Bowl 18 in. Cambro Cam-Ware Plastic Pebble Bowl 12 in. Cambro Cam-Ware Plastic Pebble Bowl 8 in. Salad and soup Bowls for restaurants and other foodservice operations should help make your tables and presentations look nice for the patrons.